Swimmer Grant Turner may retire from the sport after missing out on a place in the England squad for the Commonwealth Games. 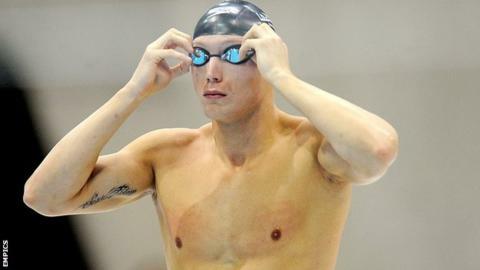 The 25-year-old won silver at the 2010 Games in Delhi and represented Team GB at the London Olympics in 2012. But he failed to make the cut for the 39-strong team for this summer's competition in Glasgow. Grant Turner, along with Simon Burnett, Liam Tancock and Adam Brown, won silver in the men's 4x100m relay final at the 2010 Commonwealth Games in Delhi. "It's something I've been looking at, as to where I take my career next," Swindon's Turner told BBC Wiltshire. "I need to give myself time to think, whether I try a different training programme or try my hand at something a bit different. "I wouldn't say it would be an early retirement. I feel like I've achieved everything I want to achieve to date." Turner admitted he needed a personal best in the 100m freestyle at the British Swimming Championships to give himself a shot at an England squad place. But he could only finish seventh in the competition with a time of 50.74. "My performances haven't been at the standard I set myself," he added. "But I've been very fortunate to compete internationally since I was 16. "There could be more to come, but also that could be it and I'll be able to walk away from the sport with my head held high."